KID GRID™ artwork preserves the mercurial moments of your little or big ones. Perfect for birthdays, milestones, gifts and empty walls. 15 minutes in front of the camera, instant review and selection, custom designed artwork, and the pleasure of a contemporary artwork with personal meaning. It was an experience where both the adults AND EVEN the kids have fun! Yes, kids having fun at a photo session. Amazing! Mind-blowingly fun. Fast, hilarious, treasureable. 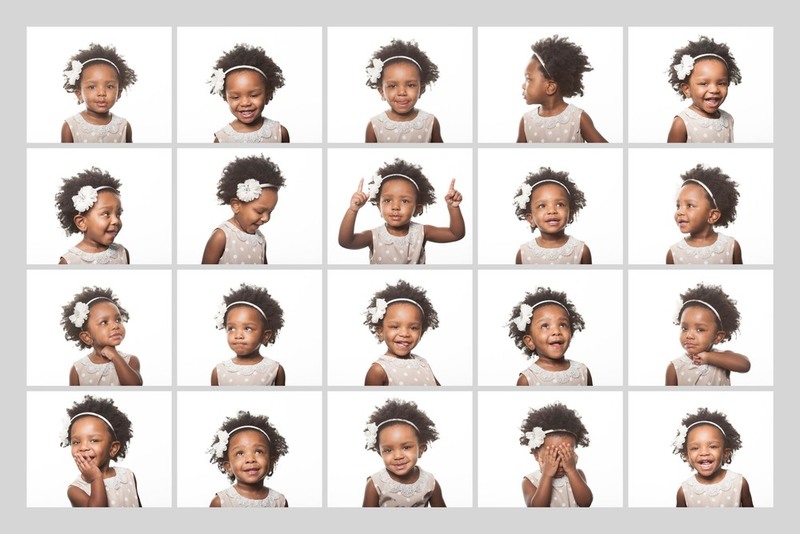 Kid Grids sparkle with the personality of the subject. an artful reflection of your child. We developed KID GRIDS™ as a specialty item over the course of 10 years photographing families and kids. They have been so desired we now offer them as a standalone experience! When can we book a sitting? It's great to get babies and kids at their best. That's usually in the morning, after a nap, or post lunch. We have weekday and some weekend availability. What's the best age to do this? We hope you love your KID GRID™ so much you come back and do one each year. The best minimum age is when they can sit up. There's no maximum age. We can make one of your grandfather, if that's your wish. What if my child isn't behaving? The beauty of the KID GRID™ is the more range your offspring exhibits the more varied the sequences in your grid will be. We won't torment a child, but if there are tears along with the laughs, it won't be in vain. The million dollar question – the answer, bring as much as you like. Props and accessories are fun to have, for both amusement purposes and potential cameo appearances. We have some on hand, but it's always great when the item has some meaning to you. If you want personal shopping we offer that for a small extra charge. Your child is the star here. If they can pull off an awesome baby Gautier, alright then. Ultimately the wardrobe should reflect your style, and honestly, even your decor because it's going on your wall. Modern, classic, sweet, eclectic, gothic - you can't go wrong. Can you put siblings or twins in the same KID GRID™? Yes. The minimum order is $400 instead of $285 when photographing more than one child for the same KID GRID™. We may use less images but we also create and include a bigger artwork so you can see their expressions well. Do you give the digital files or can we buy them? We give you a screen resolution file of your final artwork to share. Individual images are also available to buy. Want to see more KID GRIDS™? The sitting is included in the cost of the artwork. We print on metal, wood, or traditional photographic prints and framing. Pricing starts at $285 for a ready to hang 11x14 wood or metal print. Have a specific questions? Get in touch below. Want to know when our next KID GRID™ special event is? They come with extra bonuses.